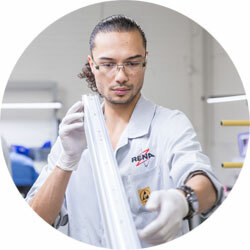 At RENA, you are part of a fast growing family business with traditional values. For our production and assembly departments, we are looking for people who have the power of innovation. Aside from your day to day work, you contribute to the improvement of our processes and techniques. You’ll do all this within a strong team of supportive colleagues. We offer you the certainty of fixed working hours in your own region against a market-rate salary. You will also, of course, have room for professional growth.